SokobanCCLP Discussion - Level Discussion - CC Zone: The Next Level - Chip's Challenge/Tile World website! This is the official discussion thread for the custom levelset SokobanCCLP. Feel free to share your thoughts, opinions, and comments on the levels here! I am really enjoying the set so far. So these are just sokoban sections from various levels right? Sokobans are my most favorite CC puzzles of all time. Just based on a skim through in the editor alone, I can safely say that this is certainly unique in being nothing but a set with awesome titled sokobans and nice aesthetics. Nothing like it exists and I do appreciate that this was done! However, I'm not sure how good of an idea this is exactly. In hindsight all of these are adapted so originality isn't exactly there, with the exception of the clone buttons being added to the mix of the larger sokobans. And at 149 levels... that's quite the amount to include. But I can easily see that this isn't really a set you'd want to play in a single sitting. I'll give this a go regardless, these are just my initial thoughts before playing. Glad to see you're still around. This is, I am not going to lie a quite difficult set. Difficult in a great way though, the progressively difficult sokobans are great brain teasers and really makes the player think. So far I am on Tangled Strips (42). Right now I am on Bewilderness (62) as of now I had to skip Backwards Muffin (59). I have tried many different positions and the farthest I have gone to is one trap button. In other words I cannot see this level after many tries. 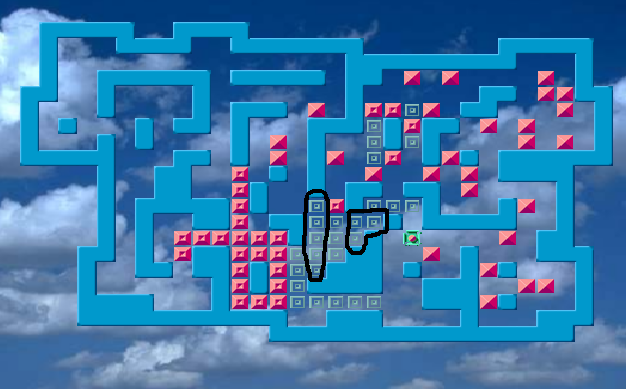 I also copy and pasted this level in a sokoban solver and the solver can't seem to solve it either. Am I missing something or is this sokoban unsolvable? This is the only level I had skipped so far and I am hopelessly stuck on it. I'm gonna need some assistance on The Spoon Doesn't Even Exist (82). Mainly the 2 rows of buttons below the tank. The rest of the blocks I can just push in. I have tried everything I just keep having buttons left over and I just can't seem to find a way to fill both rows of trap buttons. For level 82 I found a video that closely resembles this level. The only difference is that there is no extra single trap button to the left of the 2 rows of trap buttons below the tank which is also a difference. Original level 82 solution. This leaves me with just that button to deal with which seems impossible. There isn't enough room to make that happen. In the video it didn't have that tank mechanism nor the extra trap. If neither of them were here then this would be possible. Right now it seems impossible and I need help unless I am just overlooking something or I am just not getting it. I am going to say that Modest Tallens (92) is impossible. Unless a recess wall was supposed to be placed somewhere I am calling this one impossible. Maybe it's worth taking a break from playing the set and come back to it when you feel ready to tackle the puzzle(s) again? There's no harm in doing that if you're having this much trouble. As mentioned in my comment, this isn't the kind of set you'd want to complete as soon as possible. Take a breather. Guess you're right. At first when I played this set it was kind of fun. Now it's just really difficult and I am only on level 92. On #93, store five blocks in the upper/upper-right area as you fill in the rest except the top six buttons plus the middle circle you drew. Then bring down one block for that middle circle. The rest falls in place easily. I found the trickiest thing in this level to be how to start extracting blocks in the beginning. Undoubtedly all the sokobans in the set are supposed to be solvable, but with #92 it would be nice to get a confirmation that the CC level is also. The problem seems to be that Chip ends up in a place from where he can't reach the exit. Both Modest Tallens and Ziggurat Vertigo solved! Modest Tallens (92) is solvable now. Thanks. Made a LOT of progress from my last post, now on Block Enthusiast (106) had to skip Poor Impulse Control (102). My closest solution was only one trap button remaining specifically the trap button on (17,16) that when I fill it just blocks me from reaching the exit. Made a LOT of progress since my last post. Managed to beat every level until Ripple Mountain (112). For now I had to skip that level and play up to Trouble in Terrorist Town (117). For 112, the trap buttons on (12,14), (12,15), (12,17), and (12,18) are killing me. Rest of the trap buttons just fall into place. For 117, I am pretty sure the sokoban is solvable and I pretty much know how to pull it off. However the time limit may be a bit too short to complete it. 500 seconds doesn't seem like enough time to solve it. I am starting to believe that time limits are becoming a concern now. You sure you got that name right? Meant ripple mountain, . Ragged mountain is an amazing level though. Since my last post I have made it to Network Dynamics (130). Almost done with the set. For level 130, I cannot for the life of me figure out how to cover the trap buttons on (13,14), (15,14), and (17,14) near the end. The closest solve is around the 11 minute mark. In conclusion 129 levels done so far, 20 more to go! Just need the redesign on 117 and assistance on 130. Now that I am close to the end of the set I am bracing myself for anything. Also want to give a shoutout to Miika for helping me with some of the levels too. UPDATE: Now on Moon Bridge Surplus (137) and still stumped on 130 and 132. For 138 (2:45:12 in the video) it is a different alignment of blocks and traps. I tried both of them since I got stumped on both levels. Also skipped 137 since I don't see how to complete it. Therefore, I don't know if both levels have a design error or what. Anyway 134 levels completed and 15 more to go and special thanks to Miika for assistance on some levels. hmm, not sure where to respond (PM, Discord...) but figured this thread might help someone else too. Martin, you asked about levels #130, #132, #137, #138. I was gone for a week but finally today had some time to look at these. I solved the first three but not the last one. They are quite involved and it is not easy to give simple hints for them. They all share one aspect though, and that is you really need to plan on how you are going to get the last blocks into place and how you can setup for such a situation to occur. In Network Dynamics, you need a path from the top room's door through the center trap room to the right door open for as long as possible. Looking at the attempt video you posted on YT, perhaps the first idea you were missing was storing a block at (14,15) for a while and then bringing it later into the right side of the center area. You'll need a block at (15,9) before you put one at (15,12). This was a pretty puzzle, and I even liked how stuff worked in the SE room. Rigid Internal Logic was the easiest for me. You need four blocks in the NW area before you start filling in the right column of buttons from the top down, leaving the middle column last. At the (relative) start, the block at (12,15) moves down a tile and then you go around it on the right to push it back U and then L. This was not a bad puzzle, though I would like the right room to have fewer blocks, perhaps balanced by not needing all the buttons in the middle column. Moon Bridge Surplus needs more time than 250 seconds. My first solution was just under 400 but with considerable planning. I was able to improve this down to about 230 seconds or so to solve the actual level but it required much more effort than levels around it. (I plugged it into YASO and that theoretically shaves off another minute, but the route is inhuman to discover.) In any case, the puzzle is very clever. There are multiple subgoals to reach, with the important one being how to get to storing five blocks in the SW area. There's also a lot of manipulation of blocks in the NE, specifically in the square (17-18,12-13). The first two traps I lock down are (16-17,19) and then much later (14-15,19). Anyone looking for a puzzle to mess with their mind should give this one a go. Does anybody know how to beat this sokoban? This is super difficult and I am completely lost. As of now, I have completed 145 levels and I only have 4 levels to go. Almost there. I know it's been over a month since I've said anything about that set but I've recently completed 146 and 147! . Just 2 more levels to go! I am still stumped on level 144 and the video in the last post should have my attempts. For the trap buttons circled in black, I don't see a way you can cover them all at the same time without filling one section up and blocking access to the other part. In other words if I place 5 blocks onto the circled column, the set of three trap buttons can't be filled and vice versa. Now, this is how far I've gotten and I don't know if I already screwed up. But anyway 147 levels complete! Just 144 and 149. UPDATE: I managed to fill up the trap buttons which were circled in black, problem is I can't get out. I am assuming that you have to complete the left portion first before completing the right side. But, the trap button on (16,17) is kicking me. And if I complete the left side first I can't get out. Unless there was supposed to be a teleporter somewhere in the level. For now I am calling this level impossible.